-One Ball, called a football is used between 2 teams. -It is usually played on a grass field with two symmetrical halves. -Each Half has a goal at the end of it facing each other. opposite your team at each end of the pitch. The game usually lasts a set time, which in professional leagues is 90 minutes with injury time added onto the end. At 45 minutes (half way) there is a half time break usually of 15 Minutes. -Striker or Forward- These players usually play up front of the team and are the main goal scorers. They have to be fast and have good stamina and ball control as well as good perception about what is around them. -Midfielder- These players usually are quite tall as they receive the headers from goal kicks quite often. They need to be good at sprinting with the ball and also have passing skills second to none in order to get the ball from defence into the forwards. -Defender- These are usually the strongest and agile platers on the pitch who know how to remove the ball from the opposite teams forwards and take it into midfield. Excellent awareness of space and timing are what make good defenders. -Goal Keeper- The Goalkeeper is exactly what it sounds like. This player keeps by the goal net and is in fact the only player that is allowed to use his or her hands. They can stop the ball anywhere they want inside the box with their hands. 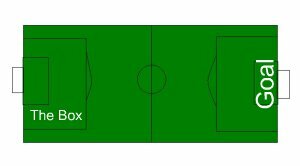 (The box is an area around the goal net, see diagram for box). As far as Football rules go, A Very frequent question amongst new players is "What is the offside rule?" or "what does offside mean?". Basically offside is when an offensive player is about to receive a pass whilst he is positioned between the last defender of the opposite team and the goalkeeper of the opposite team. The reason this rule exists is so that defenders always have a chance to stop the offensive players. Right...Learnt all your football Rules? Why not brush up on some Drills? Click here to find some football Drills.